(《複数形》 opossums，opossum) 【動物, 動物学】 オポッサム 《北米および南米産の有袋類; 危険にあうと仮死状態になり「死んだふり」をする; cf. possum》. From Powhatan aposoum (“white animal”), from Proto-Algonquian *wa·p-aʔθemwa (“white dog”); compare Ojibwe waabasim (“white dog”). Sometimes falsely attributed to a Latin origin, as if from *oppossum; confer actual Latin possum (“I am able, I can”). Any American marsupial of the family Didelphidae. The common species of the United States is Didelphis virginiana. 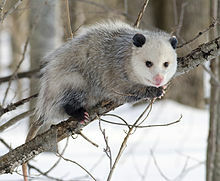 ↑ 1.0 1.1 “opossum” in Dictionary.com Unabridged , Dictionary.com, LLC, 1995–present. ↑ 2.0 2.1 “opossum” in Merriam–Webster Online Dictionary. ^ “opossum” in the Collins English Dictionary , Glasgow: HarperCollins Publishers. opossum in Webster’s Revised Unabridged Dictionary, G. & C. Merriam, 1913. Opossums (Didelphimorphia, /daɪˌdɛlfɨˈmɔrfi.ə/) make up the largest order of marsupials in the Western Hemisphere, including 103 or more species in 19 genera. They are also commonly called possums, though that term technically refers to Australian fauna of the suborder Phalangeriformes. The Virginia opossum was the first animal to be named an opossum; usage of the name was published in 1610. The word opossum comes from the Proto-Algonquian aposoum, pronounced *wa˙p- aʔθemw, meaning "white dog" or "white beast/ animal". Opossums probably diverged from the basic South American marsupials in the late Cretaceous or early Paleocene.